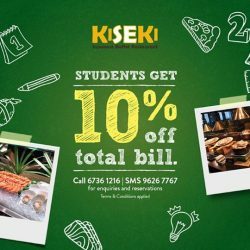 Till 27 Apr 2017 Kiseki Japanese Buffet Restaurant: 1 Dine Free with 2 Paying Adult Diners Promotion Extended! 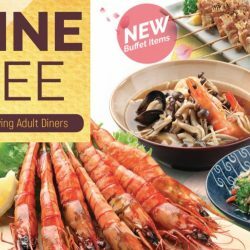 Due to overwhelming response, 1 Dine Free with 2 Paying Adult Diners PROMOTION has been EXTENDED to 27 April 2017 at Kiseki Japanese Buffet Restaurant! Enjoy a wide selection of unlimited delectable Japanese food, Sushi, Sashimi, Teppanyaki, Robatayaki (Japanese grill), Yakitori (skewers), Nabemono (hot pot items), Agemono (deep-fried items), Mushimono (steamed items), Japanese Western (pasta and pizza) and much much more! *Available from Sunday to Thursday at dinner only. *Not applicable on eve PH/PH and special occasions. Hard Work deserves a REWARD! We reward hard work with MEGA offering of Japanese buffet items and 10% off food bill. *Applicable from Sunday to Thursday dinner till 31 August 2016. *Flash Student ID to enjoy the sweet deal.